click on other menu buttons above for other segments of the project. The R. A. 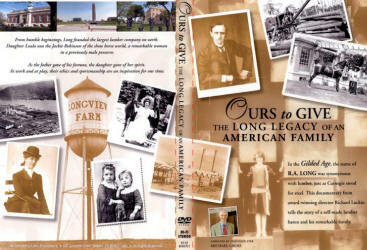 Long Historical Society has announced the release of a documentary film, Ours to Give: The Long Legacy of an American Family. The film was premiered at Liberty Memorial on November 18, and had its broadcast debut at 7:00 pm on KCPT (PBS television) on Thanksgiving evening, November 22, 2007. Eighty years ago, any Kansas Citian would have known the name of Robert Alexander Long. He owned the world�s largest lumber company, and his daughter smashed gender barriers in the show horse world. Today, Long is best remembered locally as the builder of Longview Farm in Lee�s Summit and Corinthian Hall in Northeast Kansas City � the home of the Kansas City Museum. Ours to Give takes a fresh look at this remarkable family and finds several important legacies for our times. Mr. Long was an ethical businessman in an age of robber barons. His environmental principles were decades ahead of his time. He gave millions to improve the lives of his employees, going so far as to engage J.C. Nichols and George Kessler to design the planned community of Longview, Washington. He spearheaded the drive to build Liberty Memorial. Daughter Loula Long Combs was a hugely successful competitor in world-class, previously all-male events. Queen of the American Royal and the first equestrian woman in the Madison Square Garden Hall of Fame, her sixty-year competitive career has no equal to this day. The Long�s story is told through archival photos and film footage, through interviews with people who knew them, and in narration by noted actor Michael Gross. Kansas City area locations include Longview Farm and the Longview Farm Elementary School in Lee�s Summit; Corinthian Hall; Liberty Memorial; and the R. A. Long Building downtown, currently occupied by UMB Financial Corp. Local personalities include Charles Gusewelle and Laura Rollins Hockaday of The Kansas City Star; and Mike Haverty, Chairman and CEO of Kansas City Southern Railway. A gala premiere was held at Liberty Memorial at 2:00 pm on Sunday, November 18, 2007. The film had its PBS broadcast debut on KCPT, Channel 19, at 7:00 pm Thanksgiving night 2007. The R.A. Long Historical Society, a 501(c)3 non-profit organization, was established in 2006, with a mission to preserve the legacy of R. A. Long and his family. CLICK HERE to go back to menu at top of page.